1. Custom Logo: We will provide you with 3 custom logo designs. We offer up to 3 logo revisions and provide you final custom logo, ready to use. 3. 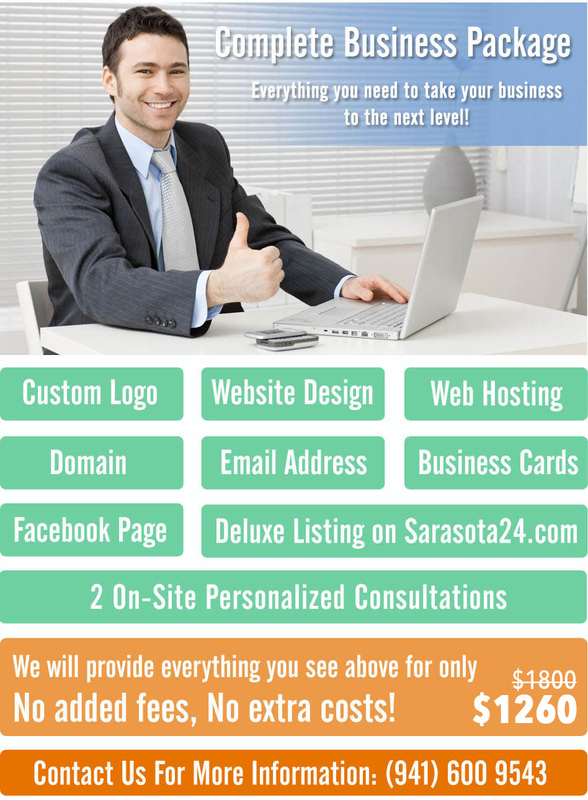 Web Hosting: Your website will be hosted on our server. The 1st year is free. 4. Domain: We'll purchase your custom domain name for you. The 1st year is free. 5. Business Email Address: You will receive 1 customized email address with your domain name (2GB). 6. Business Cards: We'll design and print 250 professional custom business cards for your business. 7. Facebook Page: We'll create a custom Facebook page for you and show you how to use it to promote your business. 8. Deluxe Listing on Sarasota24.com: We'll register your company on Sarasota24.com as a Deluxe Listing, free for 1 year (for companies from Sarasota County only). 9. 2 Personalized Consultations: Throughout the design process, we will meet you twice, once at the beginning of the project, and again at project completion.